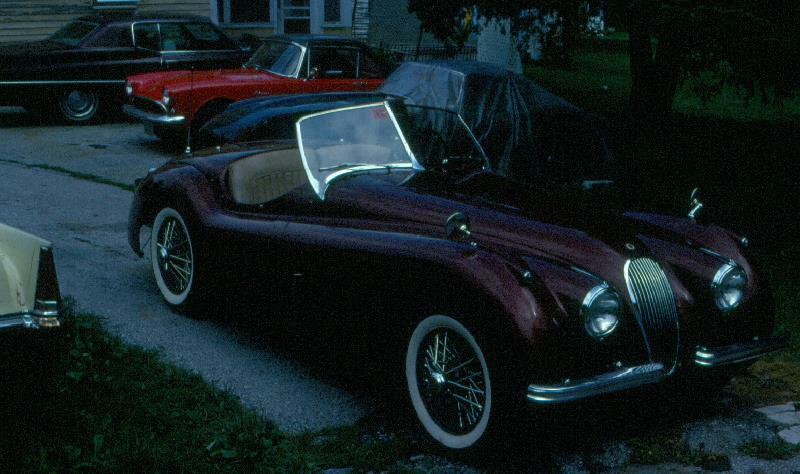 My second collector car was a Jaguar XK-120 roadster, which I purchased for $1500 in 1975. It came to me pretty hammered, no brakes, and I don't remember if it ran. 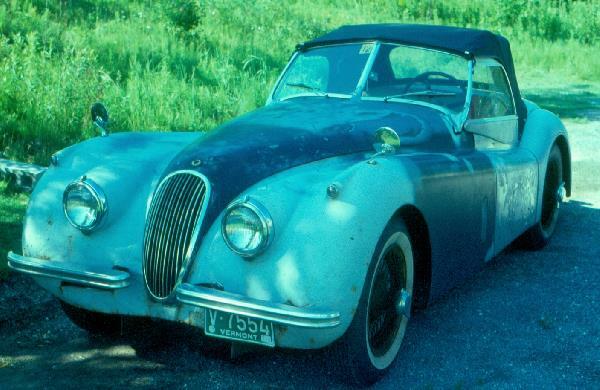 I was pleased it had wire wheels but the car was completely disassembled, a true barn find. The pictures say more than these words. First thing I did was make it run, replaced the engine timing chain, put on an exhaust system, re-did the 4 wheel drum brakes with no power assist. After a new set of bias ply 6.00-16 white wall tires, putting the new floors and dashboard in, assembling all the needed stuff, I was able to drive it. Notice the mismatched tail lights in the picture below. I guess I wasn't proud, until later. The finished wheels were my own idea and may not be received well by all. I cut out all the spokes, cleaned up the hub and rim and painted them the same color as the car. Then I laced and trued the wheels with new stainless steel spokes. I really liked the result. 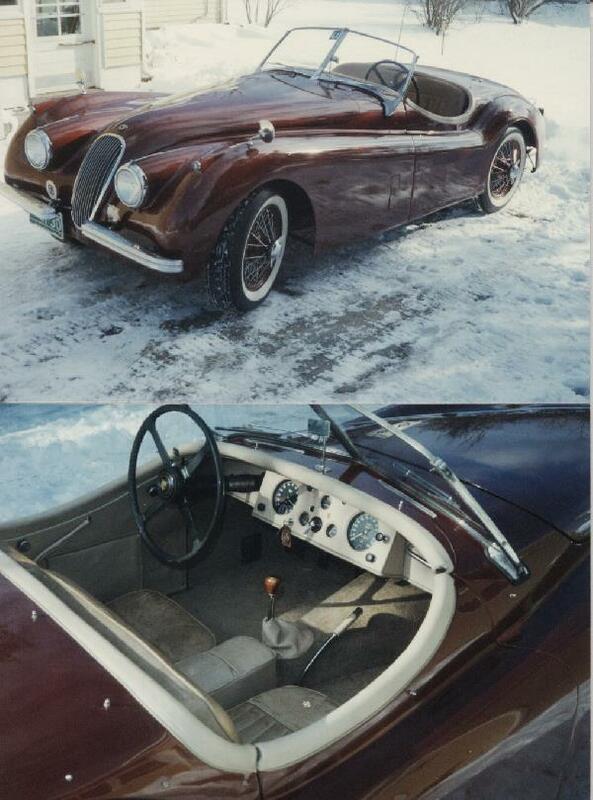 I did the upholstery on the dash and doors, and made carpets to fit. I replaced the plexiglass in the aluminum side curtains, but never used them. 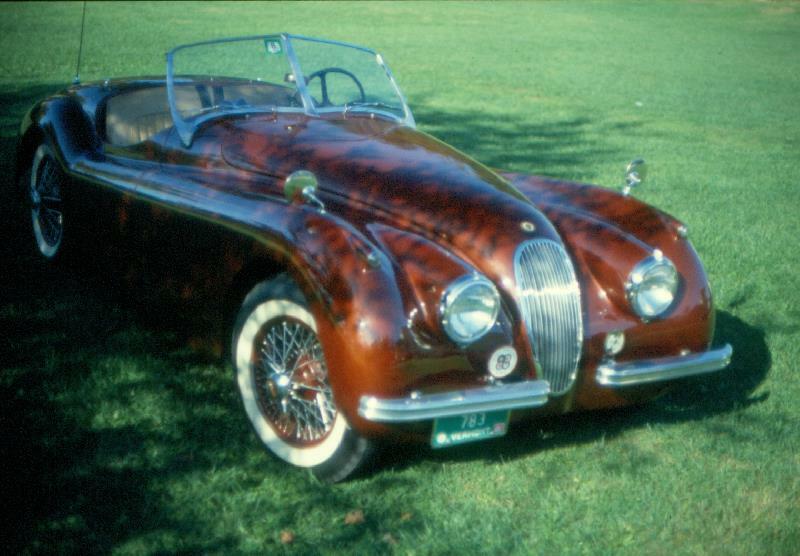 I painted the car with lacquer and rubbed it out. In case it's of interest, the car came with a four speed fully synchronized transmission from an E-type. 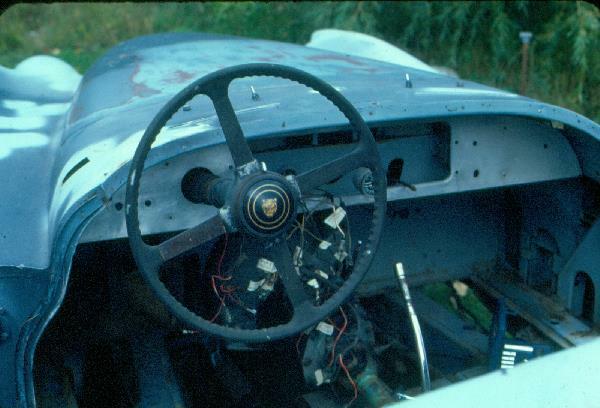 But the shifter was beneath the dash, not useable. 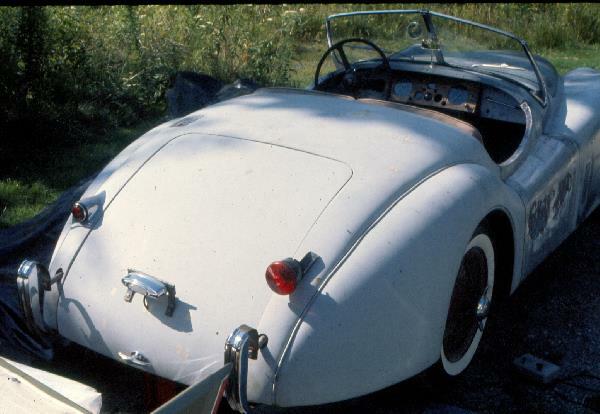 I got an XK-120 transmission top, machined the rods and forks to make it work on the newer transmission. Quite the project. Best story... One of my teacher friends stopped me in the hallway and told me what he heard on the radio that morning. The announcer looked out the window of the radio station and was aghast at the sight. "Ladies and Gentlemen, I can't believe what I just saw... It's 28 degrees outside and a man just drove by in a convertible with the top down." It was me. In the photo below is the 120 with a 5/8 scale model I started 30 years ago and never touched it for 29 years. I am nearing completion of the model which will have a mold created over this form and multiple bodies can be produced from the mold. 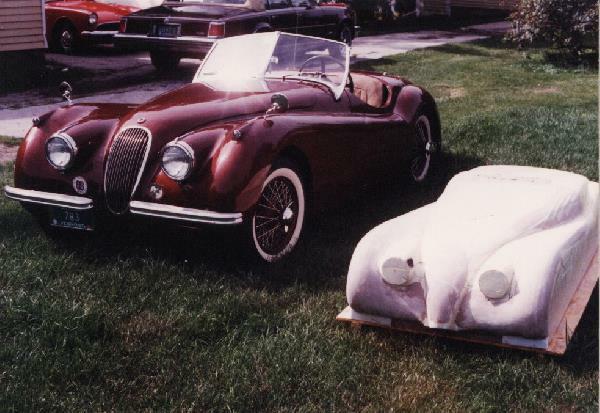 Other pictures and construction details of the "baby Jaguar" to come. I sure wish I knew what happened to that two sided enameled Jaguar sign. And one evening, my friend Karl visited me to help with final assembly. My XK-E under plastic is in the background.